You are here: Home / Restorative Dentistry / Bonding to Old Composite, Does it Work? Bonding to Old Composite, Does it Work? So, truth or fiction, we can bond to old composite that is already in the mouth? If it works, it would have some direct benefits. We could repair composite restorations without replacing the entire old restoration. If it doesn’t work however we set ourselves and the patient up for a restorative failure. The challenge of bonding to old resin is the availability of uncured resin to bond to. Once resin has been fully cured and the air inhibited or uncured layer completely removed “bonding” to it becomes difficult if not impossible. 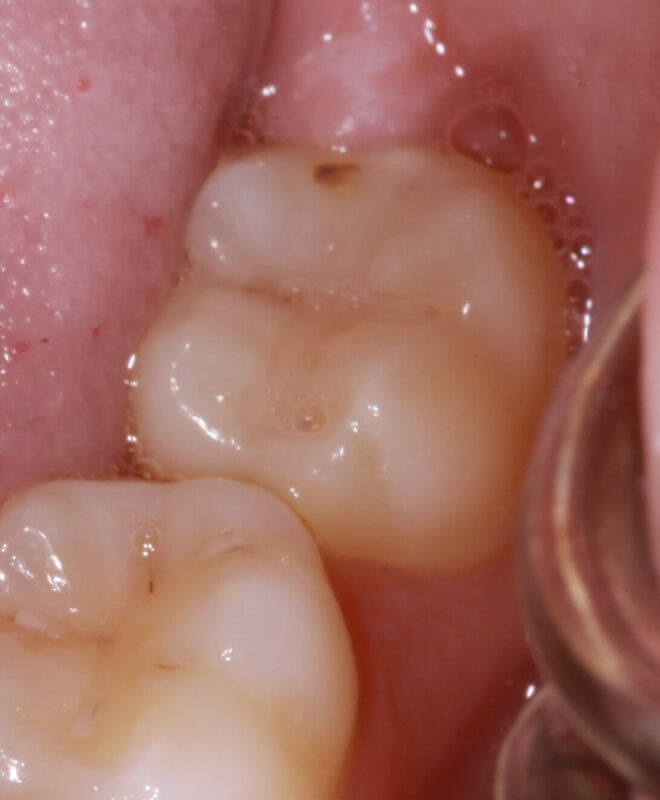 We worry about fabricating resin based provisionals over a freshly placed composite core. If we don’t place a separating medium they can bond together. This occurs because of the presence of unpolymerized resin. The completion of polymerization occurs over time. Studies show that the longer resin has been cured, the lower our ability to bond to it. In one study the cohesive strength of the restoration when repaired one week after the original increment of composite was cured was only 27% of the original when placed without using a bonding agent. The use of a bonding agent between the layers of composite showed cohesive strength of the repaired restoration at 48% of the original. additionally other studies have shown that preparing in undercuts does not improve these results. So what does that mean in clinical practice. The greatest reason to only “repair” an existing composite is to be “conservative”, potentially not removing more tooth structure and adding insult to the pulp. However, the repair is destined to fail far sooner then had we replaced the entire restoration. Thereby meaning the tooth will now be traumatized again by recurrent decay, bacterial infiltration and another restorative procedure. So which is more conservative? Hi Lee Ann, Thanks for posting on this topic…something I’ve done many times of the years and wondered about! Now I know…I’m replacing the entire composite! Hope you are doing well! That is how I do it also. Hi, does this mean bond strengths are reduced using immediate dentine sealing? I have taken to blocking out undercuts with flowable before impressing for indirect composite onlays/inlays, will this effect the final bond strength? That is a great question and we have varying reports from the research that has been done. In truth we do not have a large body of research on this topic. Some of it shows good bond strengths using IDS, there is also research from the group at USC that compared three different ways of preparing the surface during final cementation after IDS, and all showed reduced bond strengths. What most of these folks are looking for is how do we prepare the already sealed surface to create adequate bond strengths? I don;t think we have clear data yet. Question on millable composite blocks, would the same idea apply in terms of repairing a milled composite restoration? I figured someone would ask this. Milled composite is polymerized in the upper 90& range, this is the reason that we seat these restorations following a similar protocol as indirect ceramic restorations. So the composite is prepared using air abrasion, then a bonding or coupling agent is applied to the composite. the tooth is etched, and bonding agent applied and then the restoration is placed using a resin. This process fives us very similar chemical and mechanical bond strengths of the restoration to the tooth as with glass. In this case we would look at the adhesive failure of the restoration to the tooth, but the mass of composite has very low cohesive risk because it is a solid highly polymerized block. When we repair a milled restoration or a direct composite that has reached a high level of polymerization, we now add the risk of failure die to separation of the two increments of composite. So long answer to say that yes I would also be cautious about repairing a milled composite restoration if it fails. If I do a core buildup using a resin based material, will I get a good bond using a resin based cement for my restoration? Or I need to prepare differently? Cris, the answer to that depends on the time frame between the buildup and the cementation. Bonding to resin requires the availability of monomer and open chains for cross-linking. Within 14-30 days the unused monomer leaches out and the ability to bond to it easily goes away. In addition if you coat the buildup with a lubricant prior to making the temporary so it does not stick, this can impede bonding, as well, as the temporary cement you used. If you want to bond the easiest way is to use a 27micron aluminum oxide in a chair-side etching unit to clean and etch the buildup material, then apply a dentin adhesive or multi-surface conditioner. 1. just do the composite restoration for the access where at one surface it would bond to emax and rest surface with dentin & enamel. 2.remove the inlay ,do resin core build up followed by full coverage crown. Posterior teeth have a much higher long term prognosis if the have cuspal coverage. I would recommend at least an onlay to prevent this tooth fracturing and losing a cusp or the tooth being lost. What are your thought of leaving a base of existing resin over areas close to the pulp if freshly prepped dentin is available for bonding in new composite completely around the base?